Proper tree care begins with selecting the right tree and planting it in the right place. Trees are for a lifetime, so it pays to spend time now making sure that your tree will thrive where you want to plant it. Find a tree with the Arbor Day Tree Wizard. This free online tool will help you narrow down your choices and help you select the right tree for the right place. 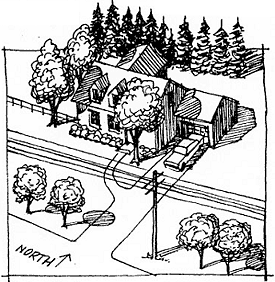 Planting large trees under utility lines can eventually mean mutilated trees as they grow to maturity. Large evergreens close to the house on the south block warming winter sunlight. No trees on the north side of the house can leave it vulnerable to icy winter winds. Short, flowering trees don’t clash with overhead utility lines. Large deciduous trees on the southeast, southwest, and west provide cooling shade in the summer, but don’t obstruct the low winter sun. An evergreen windbreak on the north blocks cold winds in winter. Learn more about planting the Right Tree in the Right Place. Step 1—The Tree’s Purpose: Start by defining the purpose for your new tree. Common purposes include aesthetics, privacy, shade/energy reduction, windbreak, or street tree. Your end goal will impact the suitability of different trees. Hardiness Zone: your location and weather have a tremendous impact on what trees will grow. 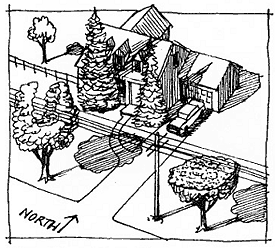 Height and Spread of Mature Trees: Example overhead wires will limit the height of mature tree and you will want to select a shorter tree. The chart below is a great representation of the range of heights of tree species. Sun Exposure: The sun exposure in your planting area will greatly affect how your tree grows. Soil Conditions: Some trees can grow in only specific types of soil, while others can grow in almost any condition the type of soil. Determining what type of soil you have in your yard will help you find the right tree. Find a tree with the Arbor Day Tree Wizard. This free online tool will help you narrow down your choices and help you select the right tree for the right place following steps 1 and 2. Now that you have found the right tree, lets learn how to select a healthy tree.